So, in Paris I kind of fell in love. Her name is Diana. The Diana is a type of camera with a plastic body. It’s feather-weight and uses 120 medium format film. It was originally designed as a cheap novelty item, the kind of thing sold for 99 cents a piece, but was abandoned and like with many toy cameras with wonky results, a cult following developed. 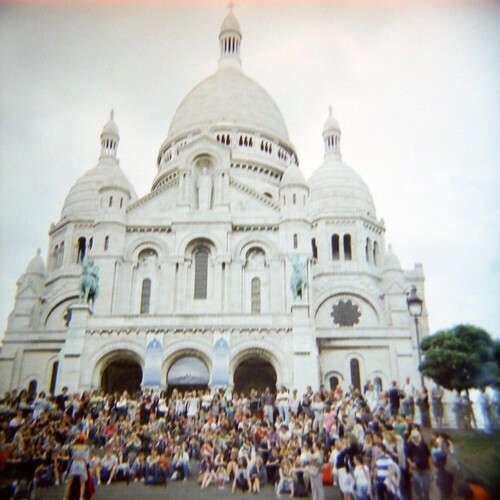 The day we decided to explore Montmartre, we stopped in at the Paris Lomography store and on impulse I purchased one. For all intents and purposes, the Diana is a crappy camera. It has light leaks, a cheap body and lens. Some might say that I could simply download an Iphone app to get the same quality of photos. But there’s a difference, and even if it’s a stubborn, misguided insistence on my part, so be it. I have a Holga, which is the same concept (plastic body, cheap, medium format), but I’ve been frustrated with it since my first roll of film. It was a little too fussy for me and I got very few usable shots out of it. It’s currently sitting up on a shelf in the apartment in Montreal. 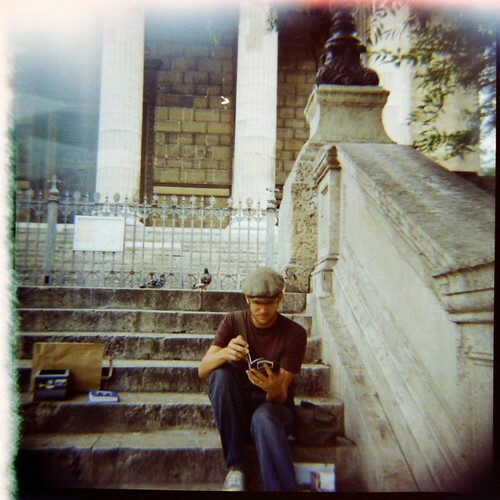 With the Diana, on the other hand, I was extremely pleased with the quality of the photos. They’re grainy and the light is wobbly and sometimes things look strangely flattened out, like I’m looking at a cardboard cut-out of the Sacre Coeur rather than the real thing. I like it. I like the dreaminess, I like the feelings these photos evoke. There’s been a lot of photography related activity in this household this summer. Andrew takes photos every day here in Athens. He’s also been reading many books about it, and I end up flipping through them as well. The Ongoing Moment by Geoff Dyer is a brilliant discussion of photography and literature, on considering photography as a continuous conversation, one where similar themes and images are repurposed and reinterpreted over the years. I read Susan Sontag’s classic On Photography. I’ve examined the photos of Robert Frank’s’ The Americans, started looking at the images once published in Steiglitz’s classic Camera Work magazine, and seen so many photography exhibits at different museums in Athens, Paris, Berlin. I love taking photographs, but the truth is that I’m satisfied with my little point and shoot. I don’t need fancy lenses, I don’t need to play with settings. The digital photos I take turn out crisp, the resolution is good, and the camera’s small enough that I can take it with me wherever I go. I’m more interested in the memories I’m capturing – I like taking pictures of my friends, of the details of places I’ve been to. Most of my artistic impulses are focused on writing, but I still get the urge to make something more visual from time to time. I decided on collages back in May, picked out the perfect hardcover notebook to paste them in and started saving little scraps of papers. It didn’t work out as planned: the notebook has one collage in it, but is fat with random papers I’ve stuck in it to use for future collages. I’ve saved too much, but it will all probably be discarded if I don’t figure out a way to use them soon. 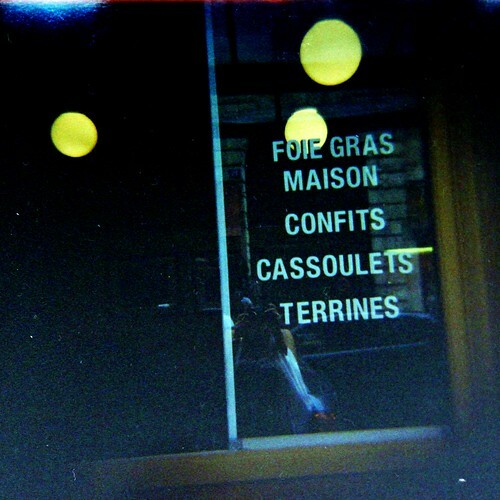 Now that I’ve seen the results of my first rolls from the Diana, I’m glad I have this little camera. It will do the trick for awhile. This entry was posted in Greece. Bookmark the permalink. What I love most about these types of cameras is that the photos look like memories. Part of our wedding photos will be shot with a Holga. Teri, I love these! I know I’ve already said that on Flickr & Twitter, but I’m just being thorough. 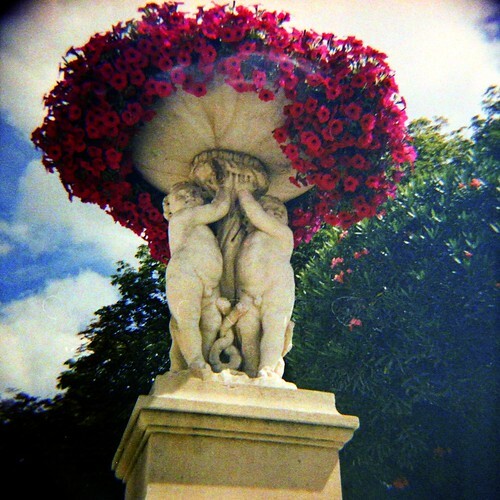 And thanks for the Diana/Holga comparison. 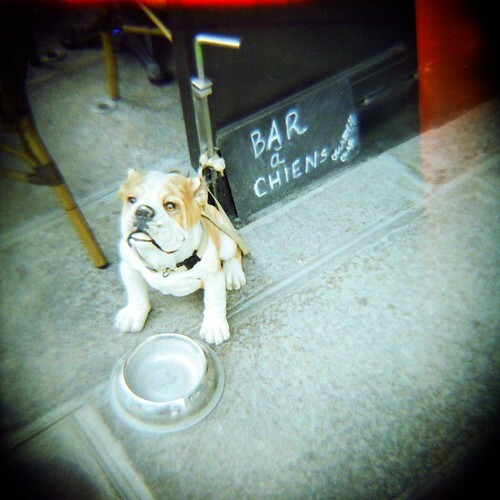 I have been slightly disappointed with my Holga but now I’m inspired to try a Diana. Amanda – that’s exactly it, they’re more like visual representations of memories. 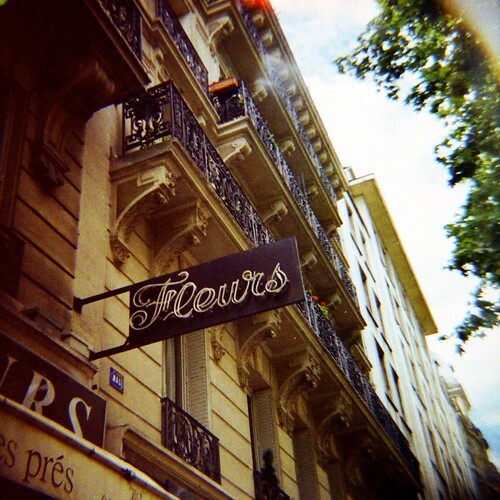 A Holga for your wedding is perfect. Many of my favourite photos from our wedding last year were Polaroids. Robert Frank, not Frank Evans you turnip, you’ve made him sound like a car salesman! POPPY! I’m so embarrassed! I TOTALLY know that, but the heat wave is making my brain melt ://// Andrew is laughing at me. Simply gorgeous, Terki. Inspiring and lovely – they do look like memories. Thank you, Melanie and Emily! I read about the Diana not long ago…these shots are gorgeous!! The one of Andrew is awesome..full of atmosphere. Thanks, guys! I’m glad I’m not the only one who likes these wonky photos. Nel, I knew you’d like the dog photo! The funny thing is that the dog is FAKE. It’s made of fibreglass, but the Diana smooths out the edges and makes it look like a real dog.